Thankfully, my mood is vastly improved from last week. After finally getting over the customary mid-winter respiratory illness, my training for Manchester and Comrades has finally started in earnest. I have run just shy of 60 miles this week and I booted myself into action on Monday by running to work and back, but instead of the standard 5.5 miles return journey I took a long route home of 14.5 hilly miles. Having not done anything approaching a long run for ages, I found it tough. After about 8 miles I was starting to struggle and I thought to myself “what are you doing? You could be home by now watching Eggheads and having a cup of tea”. With no other option, I ground it out, shuffling slowly up the final long drag from Otley to my home village of Bramhope. I didn’t enjoy it much, but I am glad I did it. I did another double day on Tuesday – after a run during my lunch hour I went up to the Beckett Park track for the Valley Striders monthly track session. As often happens around this time of year, the track was frozen, so under the expert direction of coach Hannah, we did a make-shift session around the campus roads of 4 x 700 metres. After the warm up, my legs felt shot, but I managed to crank out something around half marathon pace. It wasn’t one of those fantastic confidence building speed sessions, but again, I’m glad I got it done. I ran steadily for the rest of the week. It was a big half marathon racing weekend up in Yorkshire and Lancashire, with the Brass Monkey half in York and the Inskip half in Preston. I had an entry for the Inskip, but I had to miss it as I had to travel to Woking to celebrate my friend Angela’s 40th birthday. I squeezed in Leeds parkrun before setting off and was delighted to finish 4th overall, equalling my second best ever finishing position. I was helped by the fact that the course was extremely icy – indicated by a winner’s time of 19:22. I had sensibly worn trail shoes which gave a slightly better traction than the road shoes that most of the field were wearing. I was initially a little bit miffed at missing the half marathon, but I had a brilliant weekend to make up for it – catching up with some old friends that I hadn’t seen in years and spending some precious time with two of my best friends in the World that I get to see very rarely. There is much more to life than running. Ange’s husband, Tim had promised me that we would go out running on Horsell Common on Sunday, but when we were still drinking and dancing at 4 a.m., I knew that wasn’t likely to happen. However, Tim persuaded me to enter the Berlin marathon in September with him. It’s a race I have done twice before and it owes me. 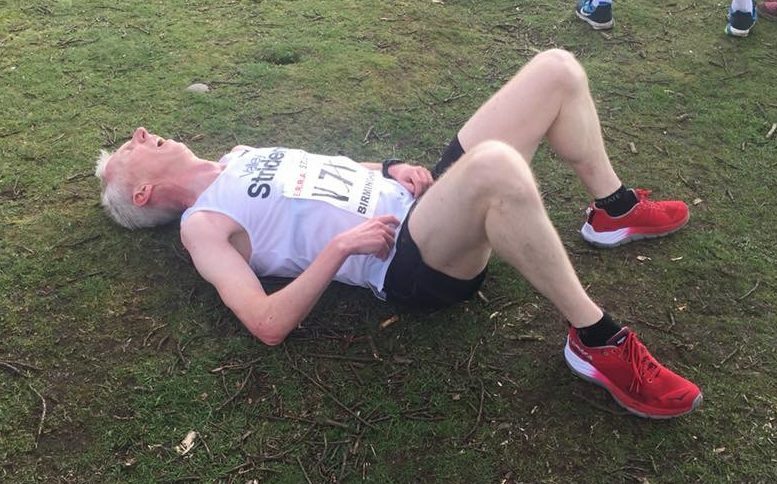 On both occasions I ran it (in 2009 and 2011) I had a shocker – twice setting off too quickly, suffering terribly with heat stroke and limping home to run around 3:40. Hopefully this time I’ll do it justice. I must confess that I am itching to get out racing again. I haven’t run a road race since the Abbey Dash in mid-November. To me racing is the essence of what the sport is about, to push myself harder than I ever could in training and to do battle with those around me in the field. Running is such a pure sport – no special equipment, no judges, nothing subjective – just a test of who is the best on the day. I get nervous before races, well probably not nervous, but anxious. I know that it will hurt and I frequently suffer doubt during races – fearing that I am going too fast and that I might blow up. However, perhaps it is essential to experience doubts if one is going to achieve an optimum performance. Chris Boardman has said that during a time trial, a top cyclist will keep asking himself “can I hold this pace to the finish?” – If the answer is “Yes” then he has gone out too easily and has ruined his chances. If the answer is “No” then he has gone too fast, will blow and again will not win. The answer always needs to be “I don’t know”. I think the same can be applied to running. Aside from Berlin, I have been plotting out my racing programme for the coming months. I have the Northern cross-country championships next Saturday. I am a mediocre cross country runner, I’ll do my very best, but I can’t prioritise these races simply because I don’t know how to run them well. The weekend after is the Dewsbury 10K, then later in February is the Snake Lane 10 mile race and in March is the Thirsk 10 mile race. Breaking 60 minutes for 10 miles is one of my targets for the year and I’ll be going full gas at both Snake Lane and Thirsk. To have any chance of achieving my goal, I will need a nice still day, which is rare around this time of year and my best chance will probably be at Thirsk as it is a slightly faster course. I also wanted to run another 20 mile race as part of my marathon preparation. I ran the East Hull 20 last year, but this year East Hull falls on the same day as Thirsk; so I have entered the Locke Park 20 in Redcar the week before Thirsk. This will be interesting as its 20 laps of a 1 mile loop! I’ve also entered the Salford 10K on Good Friday, a race I do every year. This year this falls before the Manchester Marathon. It’s probably not wise to run a hard 10K during your taper for a marathon, but as I said, I love racing. Another lovely surprise this week was to receive an invitation from StreetChild, the organisers of the Sierra Leone marathon, to be their guest a special comedy evening in London in February. It will be hosted by Nick Hewer from the Apprentice and stars Jack Whitehall with his Dad, plus some special guests. I have accepted and I am hoping to bump into some of the friends I made over in Sierra Leone last year. Great post James! Sounds like you are running really well despite the time out for illness! Thanks Julia, and well done on the half marathon PB..clearly the warm weather over there suits you!